Denouncement from San Sebastián Bachajón, adherents to the Sixth Declaration, 17th November 2016. Compañeros and Compañeras, receive our combative greetings. Here we want to make the word of our organization known regarding the latest actions of the officialist ejidal commissioner Manuel Guzmán Álvaro. Furthermore, we ask for your help in sharing this message widely. Since being recognised as taking the position of official authority of San Sebastián Bachajón, Guzmán Álvaro has carried out acts of violence with his people, in order to solicit the intervention of the authorities of the three levels of government. Since then he has been able to bring in the public forces which are today guarding the Indigenous territory of the ejido. What the current ejidal commissioner is doing is deceiving the people, portraying his struggle as a dignified struggle in defence of territory, when he is acting as a servant of the bad government. 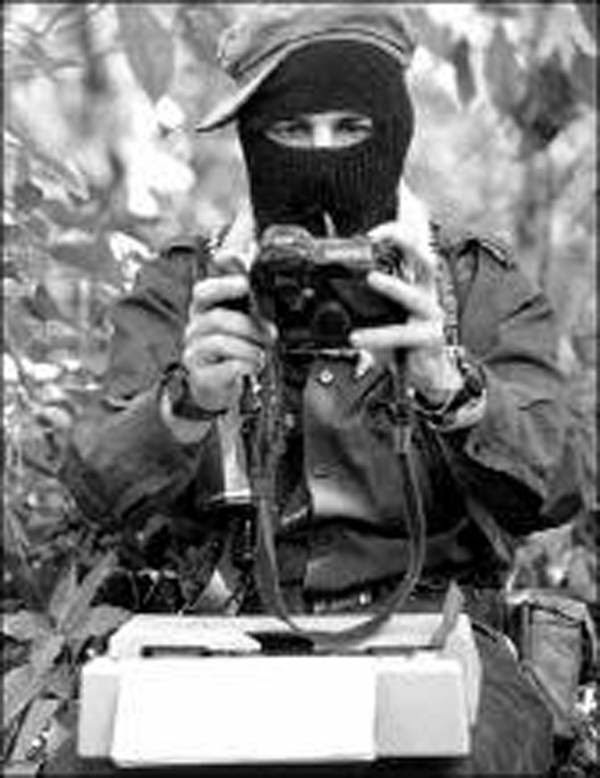 The ideas they are using today are ideas of Juan Jiménez alias “JIGO” and are the same strategies that they utilized in 2011 in the repression of the compañerxs. Not only did he deceive the people at that time, but he is also doing the same today. Juan Jiménez participated with the ex-commissioner Pedro Álvaro Hernández who was also acting against the pueblo when he was the agent of Bachajón. This was together with the ex-ejidal commissioner Francisco Guzmán Jiménez, who also participated with the ex-ejidal commissioner Alejandro Moreno Gómez. Since that time he has been participating in harassment and repression, organizing paramilitary forces to dispossess the compañerxs, ejidatarios and adherents of the sixth. Now once again they are deceiving the people, the Indigenous people who are not aware of what they are truly trying to do. Juan Jiménez is not only elaborating strategies to dispossess the lands of San Sebastián, but he is also a leader of the political party MORENA and the presidential candidate of Chilón, with the support of other political party members, as well as the advisor of the paramilitary group Paz y Justicia, who today is the sub-secretary of government of the Tzeltal and Chol jungle zone based in Yajalón, Chiapas, Lic. Alpuche. He too, has been carrying out repression and harassment against the compañerxs of the Tila ejido. With this sub-secretary, commissioner Manuel Guzmán Álvaro and his security council have maintained close coordination, as can be seen in the photographs that are published with this note. During the roadblocks that were carried out in October this year by the ejidal commissioner Manuel Guzmán Álvaro and his people, the money obtained in the roadblocks was put in to the hands of Juan Jiménez alias “JIGO” to finance his campaign to be municipal president of Chilón for the political party MORENA. This explains how the current commissioner Manuel Guzmán Álvaro is linked to the dispossession of the lands of San Sebastián Bachajón. He is participating with the political party members so that they can easily hand over our natural resources in to the hands of the bad government. We share with you the following photos which show the ejidal commissioner participating with political party members; among them the advisor of the paramilitary group Paz y Justicia, today sub-secretary of government for the Tzeltal and Chol jungle zone centred in Yajalón, Chiapas, Lic. Alpuche.